Neuro Shred – Its a focus aid that will help you burn fat, get it? Read our expert review on this GNC Beyond Raw fat burner and nootropic combo. I purchased a few bottles of Neuro Shred late last year at a local GNC, and since then – I’ve slowly worked my way through almost all of them. At the time of the buy, it was an impulse choice as we were in the middle of winter and I had no intentions of pausing my bulk. However, I did find massive use for Neuro Shred as an easy to take and long lasting energy/nootropic supplement! But now that the New Year is approaching… It’s time to burn some fat, and I’ve begun taking Beyond Raw Neuro Shred as directed. As a fat burner and nootropic supplement, Neuro Shred provides a lightweight formula that delivers many patented, complex sounding ingredients. However, behind the veil of trademark names, we find very many familiar herbal extracts. In a nutshell, Neuro Shred is a medium to high stimulant energy supplement that also assists burning some fat. It’s not the best of either, but it’s easy to take, easy to buy, and enjoyable. Quick Weaknesses: Advertised to seem more legit than it actually is. How to take Neuro Shred: Neuro Shred has both quick release and time-released caffeine, so take it early on and avoid taking it after say, 3 pm. We’d recommend taking Neuro Shred 15 minutes before breakfast. Morosil is a concentrate of the blood orange plant, which is categorized with other Citrus sinensis orange-like plants. The makers of Morosil claim on their product sheet that blood orange trees specific to a certain region of Italy produce the most Anthrocyanin rich fruit. So, they went ahead and patent trolled it. Similar to other extracts of the Citrus sinensis family, the anthrocyanins in Morosil increase the metabolism of fat cells. Well, in animal studies. Is Morosil more effective than say, synephrine at fat metabolism? Well, the research really isn’t there. But, we do like synephrine products a lot. 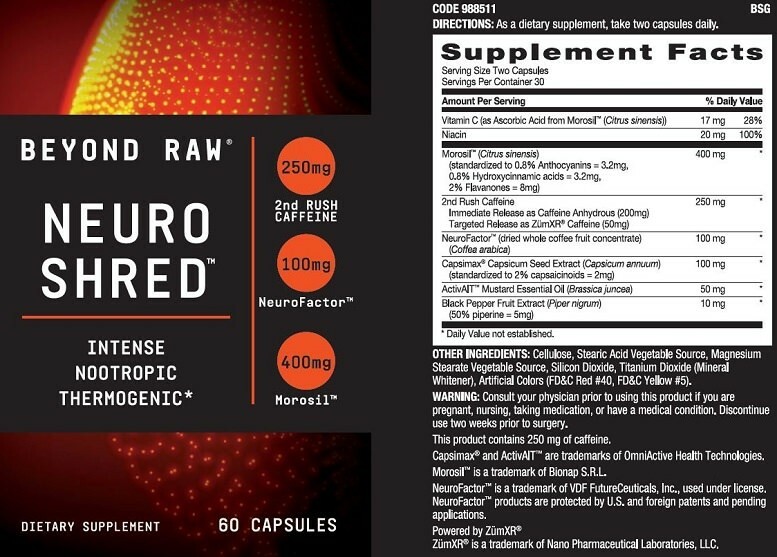 According to the product sheet for Morosil, Neuro Shred contains the proper 400 mg dosage. In Neuro Shred, we believe that the second rush formula is actually the first and second combined. Meaning, the 200 mg hits as you take it, and then the 50 mg ZumXR is time-released. Having both of these together under “second rush” leads one to think that both the 200 mg and 50 mg are time-released – which they are not. Overall, there isn’t anything special here. Just 200 mg of straight caffeine paired with 50 mg of ZumXR delayed release caffeine. Whats the purpose of the caffeine? The primary purpose of caffeine in Neuro Shred is to increase energy. Though, caffeine also acts as a thermogenic to increase calorie burn. NeuroFactor in Neuro Shred isn’t like your typical coffee ingredient. Whereas coffee bean and green coffee bean extracts are derived from the de-cased bean… NeuroFactor is extracted from whole coffee bean fruit. Meaning, there is also the ‘fruit’ surrounding the bean included in this product. Apparently, only through a whole fruit extract does the right combination of phytonutrients immerge to influence BDNF (brain derived neurotropic factor). And, this action leads to better brain health, especially in later-age adults. There was a pilot study conducted on NeuroFactor’s ingredient back in 2013, however the final results have yet to be posted. Capsimax is an enteric coated red chili pepper extract made by OmniActive Health Technologies. The method of action behind Capsimax is that it increases metabolism via the mobilization of fat for lipolysis. Capsimax has the advantage over simply eating red chili peppers due to the enteric coating, which reduces negative side effects / the negative experience of eating a bunch of red chili peppers. This is a new ingredient for me, and I looked everywhere for an explanation on it. Couldn’t find it, or its trademark owner. Strange! Black pepper extract functions two fold as both a metabolism booster and an ingredient uptake promoter. Typically, it is dosed at 5 mg per serving, but perhaps the Beyond Raw formulators believed that a 10 mg dosage would add to Neuro Shreds thermogenic effect. Would definitely prefer that they did without the synthetic colors, but oh well. The formula in Neuro Shred is quite smart, as we have noticed in other Beyond Raw supplements like the sleep aid Anabolic Sleep and the pre workout LIT. To further support this, is the description for Neuro Shred which clearly states that this product is specifically meant to increase energy and concentration. Burn fat? Well, that appears to be more-so the side effect to your heightened state of mind, energy, and responsibility. Its no secret that not all fat burners are enjoyable. For that reason, Neuro Shred earns some serious kudos for sheer pleasure and mental enhancement. Will it legitimately burn loads of fat off your body? No. But then again, even fat burners that we consider to be the absolute best out there can’t make miracles happen. You’re going to have to balance your diet, and from there a fat burner can improve your caloric deficit. Regardless, this was an enjoyable product to take thanks to the energy, and for many that’s all which is needed.